This event is the cheapest way to do a shortcut to Europe, as many would say. This tour event happens also every second Saturday of May yearly. 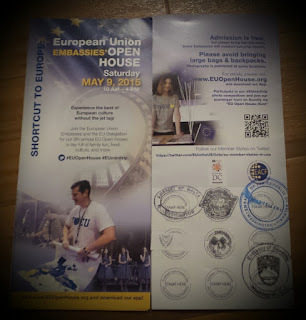 The European embassies' open house tour is a joint effort project of the Delegation of the European Union to the United States and the 28 participating embassies of the EU delegation as they open their doors to the public as they share their own culture, food, fun activities and more. It also gives visitors the chance to experience the cultural heritage and traditions of the participating embassies. Some embassies require ID's for visitors coming in and security screening checks as well, but most embassies don't. Photos are allowed as well but can be prohibited in some designated locations inside the embassy. Just like "Passport DC", visitors are given brochures with 9 empty slots for the stamps of embassies visited, but this one is free! :) So, if you happened to be visiting more than 9 embassies from 10AM-4PM, you can have as many brochures as you want. Take the chance because it's free. ;). This event is also the same thing as Around the World Embassy Tour, except that the participating embassies are representing European countries. and other events they promote.